Working on our International Day performance, All the World’s a Stage, with Mr. James Wermers was fun and interesting. One highlight this month included exploring the Renaissance: We learned about Leonardo da Vinci, Michelangelo and made our own fresco painting. Students also built catapults and studied Shakespeare’s Romeo & Juliet. Our unit culminated with students insulting each other in Shakespearean language and seeing Romeo & Juliet performed by Southwest Shakespeare Company. Huzzah! We have begun our classroom theater residency with Childsplay’s Ms. Debra K. Stevens. Thank you to AZ Commission on the Arts & Read-a-Thon donors for making this project possible. Please email Ms. Lisa to RSVP. Paper Perfect has been a wildly successful enterprise. We have raised over $2,000 for our STEM camp trip this spring. Thank you to our families and community members for your generous support. After reading Sadako & the Thousand Paper Cranes, SE students were inspired to fold 1,000 origami cranes. Our folding turned into handmade art, which turned into a booming classroom business. Thank you to the following WWII guest speakers for bringing our learning to life! Thank you to all the generous families and donors who made our Read-a-Thon a resounding success. All funds return directly to the SE classroom to enrich our learning. In science lessons, SE students explore Physical Vs. Chemical Change. During our September visit to Phoenix Art Museum, students learned about texture, perspective, immersive art and the connection between art and history. Thank you to our parent volunteers for making this trip possible. We had a fantastic team-building experience at Feed My Starving Children. The food we packed will be sent to children in El Salvador. Our class donated $242, including some Jeans Friday contributions from last spring. Great job, SE! Watching the solar eclipse on August 21 was an awe-inspiring experience. Thank you to mother nature for providing the show and Ms. Bothaina for providing the safety glasses! We are having a wonderful first week of school. Three days into the school year, students are working hard and building community. It’s a joy to learn and work together! Copy and paste this link into your browser to view a short slideshow of our first day. – Civil War “Living Museum,” featuring Abraham Lincoln, Harriet Tubman, Ulysses S. Grant and more! Our students ROCKED the 2nd Annual MDS Jog-a-Thon! Thank you to all of our amazing families and parent volunteers for supporting this great event. During our Civil War unit, we are stitching “Show Way” quilt squares in the style of the Underground Railroad. In social studies, we are learning about the Civil War. Our read-aloud is a book called The Mostly True Adventures of Homer P. Figg. It’s about a boy named Homer P. Figg and he is trying to find his brother who got sold into the army during the Civil War. We read The Drinking Gourd and learned about the Underground Railroad. In a few weeks, we are going to do a two-week simulation of the Civil War. This month we went to see The Yellow Boat, which is a play about a boy named Benjamin who had hemophilia. It is a true story. To get ready for the play, we had a guest speaker named Juan Pablo who has hemophilia type A severe. This means he is missing Factor 8 from his blood. We saw the play with our elder friends who live at Beatitudes, which is a retirement community. After the play, Ms. Debbie, who acted in the play as Benjamin’s friend, visited our classroom. That was an amazing experience. Today we are taking a field trip to Beatitudes. We are going to collect stories of the elders’ lives. We are going to make a play about their life stories and perform it for them in May. Ms. Willine is one of our grandparent friends, and her husband sadly died last week. We made a card for her yesterday to help her feel better. Congratulations to Emmy, winner of the national Scholastic GRAPHIX contest. 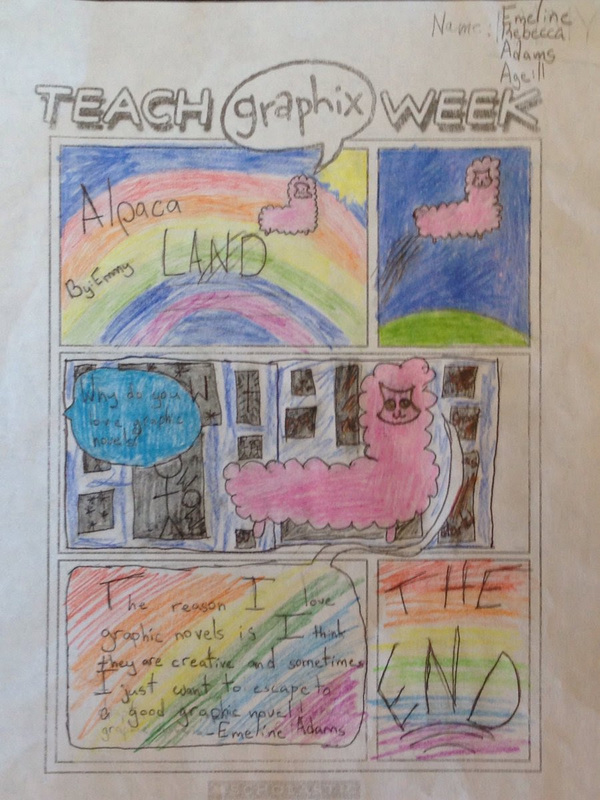 Emmy won a full set of GRAPHIX graphic novels for herself and a set for our classroom with her original “Alpaca Land” comic strip. Emmy was one of just TEN national winners. During our Australia thematic unit, students explored the geography and culture of the Land Down Under. Students wood-burned designs into their bullroarers while learning about Aboriginal culture and researched animals, including the fascinating marsupial family. We also learned about the Great Barrier Reef’s beautiful, complex ecosystem. *Guest speaker visit by Ms. Cinda from U of A to learn about Arizona water sources. We built and tested our own dams! *Exploring the “Bone Box.” Thank you to the AZ Game & Fish Department. In literature studies, we finished reading Appleblossom the Possum by Holly Goldberg Sloan (yay marsupials!) and began The Wild Robot by Peter Brown. The Senior Elementary class adopted a Syrian refugee family for the holidays. Thank you to SE families for your generosity during this project! Senior Elementary students explored the solar system and our universe. Our space studies culminated with an amazing field trip to the ASU Marston Space Exploration theater. Students held meteorites in the ASU collection, including a piece of Mars! Many thanks to Dr. Laurence Garvie for this opportunity. Our class read-aloud of Love That Dog by Sharon Creech inspired us to read poetry and write/publish our very own poems. During December, students grew paperwhite bulbs for their families, made ornaments, stitched embroidery and began knitting lessons. Thanks to Ms. Theresa for teaching us how to knit. During October, SE has raised caterpillars and compared different species of butterflies and moths. In language arts lessons, students have chosen independent research topics to explore. Student-selected topics include Monarch butterflies, bottlenose dolphins, how to make a marshmallow and the history of Legos. We have begun our African Storytelling project in partnership with Ms. Amanda Pintore of Childsplay. Students are creating scripts to the tell the stories of African activists Nelson Mandela, Wangari Maathai, and Salva Dut. Thank you to the AZ Commission on the Arts and Read-a-Thon donors for supporting this amazing project. 10% of all money will be donated to charities selected by SE students. All other money will be used for class projects, including our African Storytelling theater arts project and special music and art experiences. Our Book Character Dress-Up Day was a huge success. Thank you to families and friends for your support. Senior Elementary students use a variety of hands-on materials in all subject areas. Many small groups are rehearsing puppet shows using African Folktale Puppets, and some groups have written their own scripts. Students have learned new Montessori math materials to support their understanding of abstract math concepts including place value and fraction equivalence. We started off our year with a team-building community service visit to Feed My Starving Children. We packed food for hungry children in Ghana, Africa and contributed over $150 in donations. Thank you to the parents who made this visit possible. We are so happy to welcome both new & returning students to our classroom family! Use the link below to see photos of our joyful first day together. In human body studies, we learned about the muscular system and the cardiovascular system. We have begun learning about the colonial period in American history. In art, we practiced knot-tying and how to draw parabolic patterns. Thank you to families for sending your parent reflections. They give me wonderful insights into your children and their learning. Gardening: We have planted our spring/summer garden inspired by Southwestern tribe traditional crops. Our garden, grown from Native Seed Search seeds: carrots, radishes, jalapenos, sunflowers, beets and Devil’s Claw (used by the Hohokam for basket weaving). Check out our seedlings in the front garden! SE students led the MDS community’s “Spread the Love” peanut butter drive in February. We collected 163 pounds of peanut butter for Matthew’s Crossing Food Bank! Our all-day field trip to the AZ Science Center was amazing, especially the Busy Bones Lab in which we dissected cow bones. In the classroom, we assembled a full-scale skeleton replica, made human body paper models in small groups and used classroom materials including Sammy Skeleton (full body x-ray set) and Steve-O (his organs come out, and we put them in again). Highlights of this unit included our field trips to the Pueblo Grande Museum and the Heard Museum, making our own Katsina dolls, and creating slideshow presentations in small groups about Native American tribes. Our students are working animatedly on their novel study projects. It’s fun to see them re-reading (an important skill!) and discussing the characters, events, conflicts and settings of their books. We have students making movies, stop-motion Lego scenes, Monopoly games and more. Thank you to parents for helping make the logistics possible for students who are choosing to spend weekend time working on this project. The SE class adopted a family of six through the St. Vincent de Paul Adopt-a-Family program. Students and their families contributed clothing, toys, books, household items, a complete holiday meal AND $355 in Walmart gift cards. Wow! Thank you to all our SE families for your extreme generosity! Our Senior Elementary performed their inspiring Amazon Rainforest Tour at the Childsplay campus in Tempe. Students designed, wrote and performed the entire piece. Thank you to AZ Commission on the Arts & MDS Read-a-Thon Donors for your generous support. We doubled our goal amount! 10% of all money will be donated to charities selected by SE students. All other money will be used for class projects, including our Amazon Rainforest Tour project and special music and art experiences. Thank you to all families and friends for your support. We had a wonderful day of learning at the Biosphere 2! Students participated in a hands-on “Squid Examination” workshop and walked the floor of the rainforest biome. This day will be remembered by students and adults for years to come. Thank you to all the parent drivers who made this trip possible. Senior Elementary curriculum is organized thematically. Students are engaged daily in high-interest, hands-on activities that promote critical thinking and enthusiasm about learning. Cultural/History Studies: This spring, our cultural studies will focus on Asian cultures and geography. Science: Students work with Montessori materials and we explore units together. Our central this spring centers on the theme Our Environment & Sustainability. Mathematics: Our math curriculum implements Montessori materials and intersects with the Common Core Standards for Mathematics. Language Arts: Our language arts studies include writer’s workshop sessions, small-group instruction, daily independent reading time, and daily class read-alouds. Lead Teacher, Ms. Lisa Wyatt: I am very excited about my sixth year as the Senior Elementary lead teacher. My educational background includes Montessori certification and a Master’s in Education from UCLA. I hold an Elementary teaching certificate and a Secondary English teaching certificate. I also hold teaching endorsements for preK-12 ESL and K-12 Reading Specialist. I have twenty years of experience in education, including two years in the Peace Corps, five years at McClintock High School in Tempe, and two years at Phoenix College. I am an avid reader and gardener. I came to our school as a parent nine years ago, and my time here inspired me to begin my own path as a Montessori teacher. I love the passionate learning that happens in our classroom every day! Parent Involvement: If you have specialized skills in music, chess, foreign languages, gardening, sports, woodwork, sewing, or any other skill that you can share with our classroom, please contact Ms. Lisa to discuss how you can help. We would love to have you visit. Guest speaker Ms. Andrea discussing her experience as a leukemia survivor. Leonardo da Vinci (okay, it’s really Ms. Lisa) at our classroom Renaissance Faire in December. Students practicing movement and storytelling skills with Ms. Amanda Pintore. Students assembling their quilts during extracurricular sewing after school. Students lighting a bulb with just a battery and wire.